Life really does revolve around meals, so it is good to gather those you love and cook up a storm, or dine out together (at Salty’s). When the cooking is up to you, it is fun to get inspiration from others. I have a friend Roberto Russo who inspired me to help him produce a cookbook here in the United States. He is from Tuscany and I am from Seattle. Worlds apart, it’s true, but when you love food there is a common language shared by all. Cooking is an art form. It is an expression of a complex combination of culture, tradition, regional foods and ingredients, inspiration from mothers, friends, restaurants, chefs you’ve watched, cookbooks you’ve read and when it comes down to it, sometimes just what is available in your kitchen. The best rule of thumb is the fewer ingredients the better, so you can really savor the flavors. Some of the most marvelous recipes come from combining something from your pantry with something from your refrigerator with something from your garden and fantastico! It’s heaven when you work with family and friends in the kitchen and cook something up that you can all be proud of. Everyone helps, everyone shines and everyone enjoys. 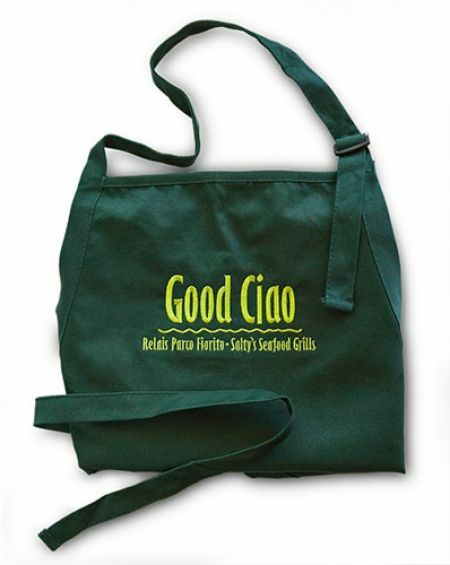 In order to bring a little Mediterranean Diet inspiration your way, I want you to know that the cookbook Good Ciao, that my friend and I worked on together, is available to you through Salty’s. (I will even personalize it for you, just e-mail me.) It is written in both English and Italian so it is fun to see the recipes side by side. About three quarters of the recipes are Roberto’s and about one quarter are from Salty’s chefs (and me), but they are all focused on the “Ciao Diet” principles. No matter where you live in the world, enjoy good, fresh, healthy cooking and living. Buon Appetito! Ciao, ciao, ciao!